Heh, yeah... rural Wisconsin is a special place. Thankfully it has beer and lakes to redeem it. Has anyone tried Senor Pan? abe_froeman wrote: Has anyone tried Senor Pan? Not yet, but thanks to your bringing it to our attention, I intend to soon. On a general note, I've noticed El Cubanito has substantially cut back on the quantity of ingredients on their Cubano sandwiches. Not quite the bargain it used to be, but still my favorite Cubano in the city. That said, their steak sandwich remains a gut-busting bargain. I still adore the place, their Cubano-parsimony notwithstanding. I've been back at least once, maybe twice. Best Cuban restaurant, probably not, entirely decent Cuban restaurant with pleasant, spiffy atmosphere in an area not otherwise overflowing with such things, yes, certainly. Drover wrote: On a general note, I've noticed El Cubanito has substantially cut back on the quantity of ingredients on their Cubano sandwiches. Not quite the bargain it used to be, but still my favorite Cubano in the city. That said, their steak sandwich remains a gut-busting bargain. I still adore the place, their Cubano-parsimony notwithstanding. I have a question regarding El Cubanito. A friend of mine, who lives in the neighborhood, had nothing but bad things to say about El Cubanito's steak sandwiches. He basically said they changed the kind of steak they use to a cheaper, inferior product. I was a little taken aback because this was the person who introduced me to El Cubanito. Has anyone else found this to be the case? My friend has no axe to grind or hidden agenda, and he's never steered me wrong. I was surprised because I never saw any posting of that sort on this site. Agree/disagree? I had a steak sandwich as recently as two weeks ago and I didn't really taste the difference. I wouldn't expect a terribly high grade of meat for a sandwich of this type anyway -- kind of like Italian beef sandwiches where the preparation method is explicitly designed to make the best of lower-quality cuts of meat -- so maybe my expectations are lower than your friend's. Habana Libre, girth does not equal good...bread was a french roll...too greasy...lechon was good, pickles too thick. The ham croquette sandwich was my favorite (so good, I forgot to take a picture until there was only a couple of bites left! ), with the ropa de vieja and the Cuban tied for second. Their website, http://www.senorpan.com, seems to be down. I've lived within walking distance of Marianao for about a decade, and it's only recently that I've ventured inside. A pity for me. I really like both their steak and Cubano sandwiches. One thing I like about their version of the Cubano is a higher lechon to ham ratio than I've found at most places — I'm more interested in the roast pork anyway, so it works well for me. I'm not sure what the golden ratio is supposed to be on a Cubano, however. olivetti wrote: I've lived within walking distance of Marianao for about a decade, and it's only recently that I've ventured inside. A pity for me. Good point, and perceptive. Ham is supposed to complement the pork -- a condiment like a slice of cheese. Too many purported Cuban sandwich shops lean on cheap boiled ham for filler. These sandwiches aren't supposed to be overstuffed, anyway. There's a balance similar to an Italian roadside panino. Problem is, most Cuban sandwich shops, and not just in Chicago, have terrible lechon. Using more would hardly help. Yeah, what a gem! In search of anything but the ubiquitous chains in the area, I had just a small amount of hope when I stumbled on Cafe Havana, which is in a strip mall next to a place called "Sweet Temptations," with a sign on the window that says "Girls, Girls, Girls". A cupcake place I guess. Cafe Havana bakes its own bread, the fresh, light crunch of which is the main thing that makes this a great sandwich. The lechon is also well flavored, and the ingredients tasted in perfect balance to me. Cute little hole in the wall with Cuban artifacts all over the wall, 5 or 6 tables, and, when I was there, a bunch of middle aged Cuban dudes with cigars sitting outside with their byob beers enjoying a hot, sunny afternoon. That bread really looks good; and very close to the bread you find in S. FL. I'll have to get out there and give it a try...as soon as I figure out where Itasca is. Steve - if you ever find it (it's very easy, actually), head a few miles east on Lake Street to a place called Italian Bakery in Addison, IL. A whole bunch of fantastic stuff, including excellent, filled-to-order cannoli for $1.55. stevez wrote: That bread really looks good; and very close to the bread you find in S. FL. It sure does! Reminds me of one of my favorite cubanos from a dive called La Familia in Gainesville, FL. They drove in the bread from Tampa. Cafecito is fabulous--I really love the lechon here--nicely caramelized and garlicky. While, as others have noted, the ingredients are very well balanced, I have to say it's the lechon that makes this sandwich. Cafe Havana definitely has the best Cuban I have had to date as well, for a nice 1-2 punch, head over to Pho Ha a few miles away in Glendale Heights for the best spring rolls I've ever had to date. That and the Super Target in that area is the only thing I miss about commuting from the city to the burbs for work. Which corner would that be? I'm having trouble finding this address on my map. 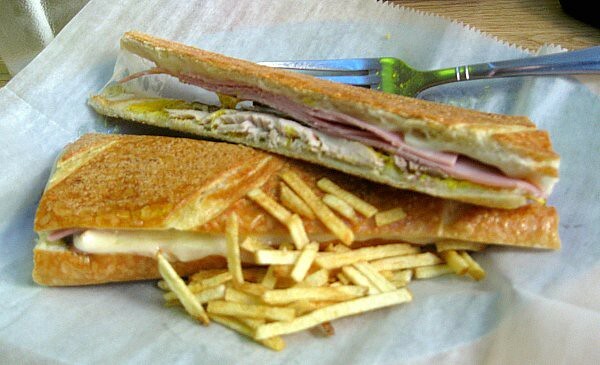 I really like the Cuban Sandwich at Cafecito in the south loop. I think Goose Island Brewpub makes a good, if overstuffed one, with really nice ingredients. I need to try La Unica. Cuban sandwiches are seemingly everywhere now! Last night I had an adequate CS at Comiskey of all places! "Comet Cuban Sandwiches" (after Minnie Minoso?) a new little cart down the left field line. It had very nice bread and was pressed with a big weight on a grill. All the correct ingredients were there, perhaps not the finest pork roast and ham, but still the meats combined with the mustard, cheese, pickle and pressed bread for a nice ballpark snack. I also spied one at Target Field (honoring Tony Oliva) in Mpls last weekend and I was tempted to try it but went instead for a Kramarczuk's brat and was quite pleased. CS perfect snack for a ballgame. Excellent Cuban sandwich to be had for $4 at the tiny storefront Thamara Cafeteria at Kimball & Palmer, which Mike Sula wrote about in praising their "gyro jibarito", which kind of sums up the absurdist vibe at this place. Nearby, on the north side of Armitage just west of Kimball, there is a Cuban take-out joint which seems to function more as a social club for a circle of friends. When I went in there once they seemed surprised, but the sandwich I received was good and I believe, $4.95. "All-natural, antibiotic-free chicken, smoked, lean ham, sweet & spicy pickle chips, Swiss, chipotle mayo & sun-dried tomato ale mustard on our Focaccia." If you havn't noticed the sarcasim by now, well then I don't know what to tell you... but really, while not a real cuban by any means, it is about what you would expect from Panera, an average sandwich made for the masses... Not bad, just nothing special. YelirNY wrote: "All-natural, antibiotic-free chicken, smoked, lean ham, sweet & spicy pickle chips, Swiss, chipotle mayo & sun-dried tomato ale mustard on our Focaccia." Authentic? I don't think so. It doesn't sound anyting like a Cuban sandwich. Sun Dried tomato? chipotle mayo? Focaccia? It never hurts to read the complete post before lobbing a grenade. I expected some better-placed snark Stevez. You've set the bar high for youself. C'mon! I guess I'm out of practice. The fact that I'm going to have to find Itasca to try what looks like a fantastic Cuban has thrown me for a loop. trixie-pea wrote: I tried a cubano from Cafe Laguardia West yesterday. This particular version contained low-grade mortadella and what seemed to be your standard American baloney. It also had the standard ham, cheese, and lechon making it one meaty sandwich. I didn't like it much--perhaps mortadella is a legitimate variation, but bologna? And to add insult to injury, instead of pickles, it had a couple Vlasic Stackers laid in. This is puzzling - they have always been excellent for me. Was at least their pork delicious and homemade? It is their house-cooked lechon and crispy fresh bread that impresses me. Can't speak to the Vlassic, but that's a funny catch. Salami and mortadella seem to be canonical if not archetypal meats in Florida and Cuba - I've had a salami version in Miami (and it looks like the one Steve depicted above may be carrying some?) Thanks for giving it a try either way. I think it may actually be cheaper than $5. Their simple lechon sandwich is also very tasty, with grilled onions; I order salsa on the side and drizzle with olive oil they keep on the table. As I've mentioned in other threads, the Cuatro brunch Cuban (my other recommendation) is non-standard but excellent. It employs a homemade aioli, roasted pepper, and a smoother, tangier cheese. It's listed as a medianoche as at some other places (some make a distinction between these two sandwiches based on meats or crusty vs. soft challah-y bread, and others don't). It's expensive but you get a big portion and fried plantains or other side; it's more akin to a Prairie Grass riff on benedict than a humble corner sandwich. I was introduced to the Cubano about 10 years ago at a little shop (long closed) on Roosevelt east of Austin. A simple sandwich with a light topping of all of the standard ingredients. They had an actual press on the premises and would prepare the sandwich right in front of you. My Bride and I had enjoyed this on several occasions before they closed. Once at Cafe Laguardia I gave their version a try and while I found everything good (the lechon and bread were awesome!) they were trying too hard to make it a deluxe sandwich by piling on just too much. Upset the balance. The good news: I was able to find Itasca . I have now received my flash of instant karma for posting without reading the entire thread a couple days ago. Sorry YelirNY.